Joseph Kony Is Back In The News. Do Teenagers Still Care? : Parallels American teenagers turned a 2012 video about the African warlord into an Internet sensation. Two years on, it shows the possibilities and limitations in social media marketing. Joseph Kony Is Back In The News. Do Teenagers Still Care? 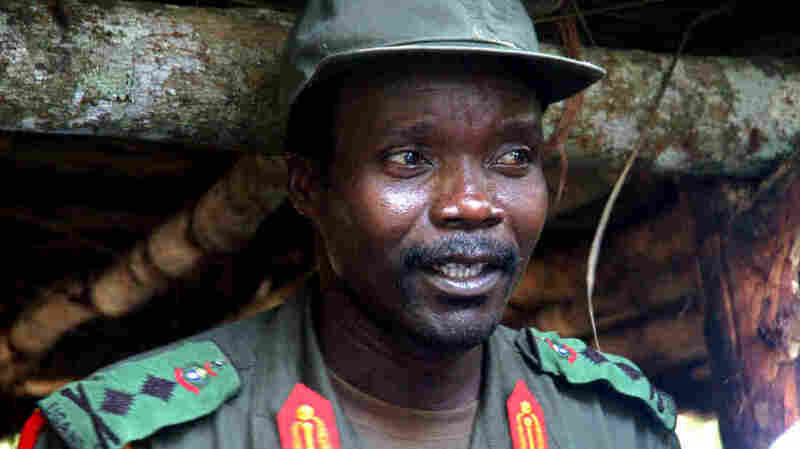 Joseph Kony, the Ugandan leader of the Lord's Resistance Army, is being pursued by U.S. special forces and African armies. A 2012 video about him became an Internet sensation. The U.S. government has stepped up its hunt for Kony, but the story is attracting much less attention today. You can learn from failures as well as successes. The story of the Joseph Kony video provides both. Two years ago, a 30-minute video about Kony became one of the biggest viral sensations in Internet history, turning a little-known central African warlord — briefly — into a household name among American young people. Kony is back in the news, with President Obama ordering 150 additional U.S. special operations personnel on the hunt for Kony. That was not the result of pressure from young people, who seemed to drop Kony as a cause just as swiftly as they elevated him. The group that produced the "Kony 2012" video, Invisible Children, ran headlong into controversy and suffered a big blow to its credibility. Two years on, however, the video and the reaction to it are still studied by some in social media, who say it demonstrates the huge impact a successful campaign can have in terms of increasing awareness, as well as the risks inherent in not being prepared to deal with that impact. "At this point, even two years later, it's a classic example of how well-designed a social media campaign should be, but also the challenges of keeping an audience's attention in the social media world," says Marcus Messner, who teaches social media at Virginia Commonwealth University. Joseph Kony Is Infamous — But Will He Be Caught? Messner uses "Kony 2012" as a case study both in class and at professional conferences. Not only was the video beautifully produced and emotionally powerful, but Invisible Children had successfully laid the groundwork for it to be widely shared online, through years of earlier videos and presentations to school assemblies. "What they did right was their strategy around engaging young people and all the on-the-ground organizing they did prior to the launch," says Beth Kanter, a social media trainer based in California. "I thought that was brilliant." Once the video went live, it was endlessly retweeted by kids and celebrities alike, viewed by tens of millions of people. But Invisible Children soon faced questions on several fronts, including its finances and its shaky sense of where Kony actually was. Things went badly wrong a couple of weeks after the video's release when Jason Russell, the group's co-founder and video auteur, was detained after ranting naked on a San Diego street corner. The video's call for young people to "cover the night" the following month by putting up posters of Kony was widely ignored. Even putting all that aside, the group's approach was problematic. It didn't offer people whose attention was drawn by the video a way to do much about the problem of violence in central Africa, where Kony is blamed for decades of killings and abuses in Uganda and neighboring countries. Despite his notoriety, his atrocities only came up rarely in the traditional Western media. "The most critical part of any viral campaign for a nonprofit is the call to action — you show the video, what do we want you to do with it," says Marcia DiStaso, who teaches social media and public relations at Penn State University. "To call people for one night — even if it had worked, there is no longevity to that campaign." The Kony video was "undoubtedly brilliant" at creating a huge moment of awareness, says Allison Fine, the co-author, with Kanter, of The Networked Nonprofit. Invisible Children, the group that released the Joseph Kony video that went viral in 2012, has been making films about Kony for years, and targeting young people as the main audience. Here, the group's co-founders, Jason Russell (from left), Bobby Bailey and Laren Poole, record footage in Africa in 2007. "Nonprofits tend to be awful storytellers, because they get immersed in the process of what they're doing, as opposed to the feelings I could be having about their issues," she says. But, she adds, moving from capturing people's perhaps fleeting attention online and getting them to do something in real life is a huge struggle for many nonprofits. A recent survey of nonprofit groups found that, for all the attention they are paying to Facebook, Twitter and other social media outlets, email and old-fashioned websites remain a much more potent force in communication and fundraising. The study suggested that nonprofit groups tend to use social media as a "megaphone," hoping to build awareness of their mission and message, but not really interacting with the public. That's a mistake, suggests Curtis Midkiff, director of social engagement for the American Red Cross. The Red Cross uses social media to be part of the ongoing "conversation," he says, whether it's sending out information about the response to the mudslides in Washington state, or thanking individuals who tweet about donating blood, in hopes such messages will get carried further. "When we see the intersection between what the broader social audience is talking about and what we do, our supporters can share our information, and that is how we move forward," Midkiff says. Nonprofits that use social media successfully will not only trawl the Internet for people who might be interested in a smart video, but supply active supporters with ongoing, even daily information. Actually getting them to do something can be a harder task for nonprofits than companies that are clearly trying to sell them something, whether it's candy or airline tickets, says DiStaso, the Penn State professor. But coming up with a sustainable campaign is ultimately more important than making a splash with a clever video. "That connection to credibility, when we're talking about nonprofits, is fundamental," DiStaso says. "If you don't have it, you have nothing, or very little. You can have the best content, but how you are remembered is really what's going to carry you through."